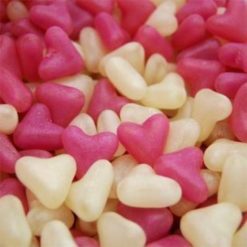 Mini Love Heart Rolls 25, 50, 100 or 3KG Bag, From 9p each! Milk Chocolate Flavoured Foiled Eggs, Choose your Weight! Sugar Coated Milk Chocolate Mini Eggs, Choose your weight! Classic Foam Shrimps, Choose your weight! Dolly Mixtures, Choose Your Weight. Milk Bottles, choose your weight! Swizzels Mini Sweet Mix, Choose Your Weight! Swizzels Fizzers, Choose Your Weight! Mixed Fruit Rock Candies, Over 10 Flavours! Cream and Strawberry Spinning Tops, Choose Your Weight! Paintball Mallows, Choose your Weight and Colour! Bonbons, Choose your Weight and Flavour!